The first 20 days of a pups life it is not capable of much learning. The mental capacity is about nil. The pup will react when it is in need of food, sleep, warmth and its mother. During the first 3 weeks it is VERY important to look after the dam as well. She will in turn, look after the puppies. Once or twice a day the puppies should be handled by a human and they should be weighed daily. During the first 3 weeks most dams like to be in a warm secluded area, not in the family living area. Pups remain contently in their whelping box for the first 20 days of their life. On the 21st day it is almost like there is a new litter of puppies. No matter what the breed, this is the time when the dormant senses wake up. From day 21 to 28 puppies are in need of their mom more than any other time as their brains and nervous systems begin to develop and they become aware of their surroundings. As mom jumps out of the box, they suddenly watch her wondering where she went. Pups may start climbing out of the whelping box at this age, so it is time to expand their home. At this stage we add a small potty area beside the whelp box . If a puppy were to loose his mom at this stage it would greatly affect his emotional wellbeing. Emotional growth is just blossoming as the puppy realizes it is alive. It is also at this age that characteristics can develop like shyness and fear. Any negative characteristics that develop at this stage in life are often permanent personality traits. From day 29 to 49 puppies will venture away from the whelp box sleeping area. They will not go far, but they will begin to explore. At this time we expand their area to add a play and eating area in the daytime. This is the time to move them out to the kitchen and family room area, where life is happening in the home. This is not the age to be in the back bedroom, garage or barn. During this time, a puppy will learn to respond to voices, sounds and recognize different people. The puppies in their group will establish a 'pecking order', some will want to lead and some will want to follow. The dominant ones will eat first and the omega ones will wait. The dominant ones can become bullies and hog all the toys. This is an important stage to watch to learn the temperaments of each puppy and should be used for placing puppies into the proper homes. Some scientific studies prove that if there is a bully in a litter that is making others cower and be shy it can set in traits that are very hard to turn around, but it is also important to leave puppies in a social group long enough to be adventurous and for the puppy to acquire some social competitive skills. On the same note, a puppy should never be allowed to get too pushy. While shyer puppies have to learn to handle themselves in social groups, a dominant puppy needs to learn it is not acceptable to be a bully. Different breeds need to be separated at different ages. Often if the bully is adopted out first the remaining puppies will loose some of their shyness. By 7 weeks, a pup is considered emotionally developed and ready to learn, but the pup does not possess an adult brain yet. At 7 weeks old the breeder of the pups can start crate training for an hour or two a day with 2 pups in a crate. This helps with separation anxiety. By 8 weeks of age a puppy should be able to go in a crate alone for a nap, and it is almost ready for its new home. A puppy should never be taken away from it's mother before 7-8 weeks of age. The mother dog teaches the puppies in the litter manners, respect, social skills, and proper etiquette, along with many other valuable lessons. When a puppy misses this stage it can cause the pup to have future behavior issues as most humans do not understand natural dog behavior enough to teach the pup these things. From day 50 on the pup is operating to a capacity where it is ready for life away from his littermates. What a puppy learns now will be retained and become part of who the dog becomes and his personality. Most dams stop caring for their pups by 7 weeks, as they have teeth and she pushes them away. If a pup is left with the dam during this period it's emotional development can be altered, as it remains dependent on her. The same can happen if littermates are placed together. They rely on each other instead of the new owner and they often do not find adequate security in their mom or littermate. They need their new owner to take over the role and it is important that the humans understand natural dog behavior in order to fulfill the puppies instincts and needs. First shots should be done at 7.5 to 8 weeks of age. When a puppy stays with his litter after 8 to 9 weeks of age without adequate human contact it doesn't adjust as well to a human social life. The optimum time to take a new puppy is from 8 to 9 weeks of age. It is always best to have a pup do his learning from his new owner and in his new home. Puppies are often adopted out at 8, 9, 10 or 11 weeks. Older puppies can do just fine if the breeder has spent a lot of time socializing them away from their littermates. 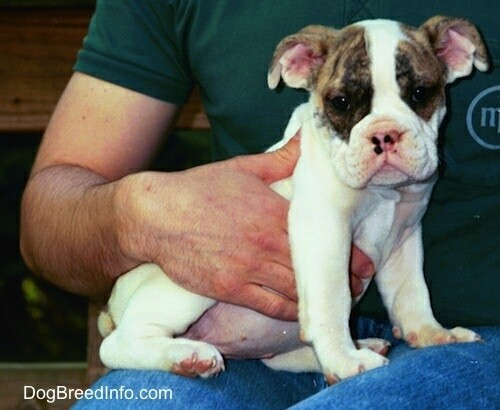 Ideally 9 weeks seems to be the perfect age for most breeds to go to new homes. What the dog learns from 8 to 12 weeks will be with him forever. At this time the puppy must be introduced to other people and go for walks on the pavement (street) avoiding dirt or grass until it has had its 2nd shots. If the first shots are done at 8 weeks and second are done at 12 weeks it is a good idea to enroll in puppy kindergarten that starts right at 12 weeks. A puppy at this age is comfortable in his new home and instinctually feels the need to form a pack. It is important to keep in mind that all puppies by this time have formed a general personality. Some are natural born leaders, some are middle of the road and could go either way and some are very submissive and really prefer not to lead anything. All puppies have an instinct to have a leader who can provide structure, because in their minds without it the pack cannot survive. Therefore even the most naturally born submissive dog may feel the need to take over as an alpha should they feel everyone else around them is too weak to care for the pack. These dogs are often very stressed out about their role because they really do not want it, but feel the need to lead just the same. After all, to them it's a matter of life or death. One of the biggest questions new owners call about is that the pup is an angel for the first couple weeks and then it starts to nip in an attempt to control things around it. This happens when a puppy does not see the humans as natural born leaders to which it can respect and it attempts to get the pack in order. If this happens it does not necessarily mean you got a bad puppy, but often means you are not being a good canine owner. Owners must be calm but firm and follow through. Set the rules of the home and stick to them. Teach basic obedience and how to heel on a leash. Do not let the puppy bolt out the door. Stay calm and confident and remember that dogs can feel your emotions. If you have emotional problems your dog knows and will see you as a weak being. Always remember to a dog anger is a weakness, so take a deep breath and control yourself. Should the puppy feel it is stronger minded than the humans it will not want to be at the bottom. Puppy owners should be prepared that the pup may attempt to establish itself as the dominant one in the family. This is where you need to understand a dog's natural instincts and learn their language so you can read them. It may see whether it can physically strike out at his owner (like some teens) and could nip or growl. Should this happen be prepared to stop the behavior immediately. It is kind of like kids wanting dessert before dinner or to stay up later. You just have to say NO. Each dog is different, just as kids are, therefore you need to figure out what works for you and your situation. If it is being aggressive one method is to pin it on its back and hold him there with a firm NO. If a pup is allowed to get away with bad behavior it will lose respect for the owner and learn that rebelling gets him his own way. The key is for the humans to be calm, confident and firm all at the same time. If you find yourself yelling or angry you as the human are out of control and need to learn how to portray yourself as someone your dog can look up to and respect. Dogs do not listen to unstable humans and anything but calm, confident and firm, to them is unstable. There should be zero tolerance for aggressiveness. Heaps of love and understanding will not stop bad behavior. A pup must be shown fast and firmly that you are the one in charge. If it persists call the breeder and/or a dog behaviorist who understands natural dog behavior for help. If you have a good breeder who understands the dog even returning him for a few days can help as the breeder gets the dog back under control and you assess your own behavior and understanding of this animal you are trying to live with. Sending a dog away to be trained without training yourself never works, as the way your dog is acting often has more to do with the humans it is living with. You can send your dog away to be trained, but if the dog returns to a human who still does not understand its needs, acts like a weak follower and/or is an emotional train wreck inside the dog will return to it's old ways. This goes for any dog of any age. Learn how to groom your dog. Teach it to lie still for grooming and nail trimming. If you are having trouble call the breeder or a behaviorist for help. It is best to have earned a dog's respect and trust in regards to grooming by 16 weeks of age. A pups natural instinct will be to periodically try to test the order in the pack. Especially if there are children. If the owner is submissive, quiet and week, thus making the dog feel the need to lead the home, its respect for its owner will weaken and the owner will become inferior in the dogs eyes. In these cases the owner is destined to be owned by the dog and you will surely see behavior problems emerge. A puppy should have a good start on crate training when it leaves a breeder's home. Help your puppy feel secure by giving it its own bed and crate in a place where it can be alone when it needs some quiet time. It should be crated for one or two naps per day, especially when making and eating dinner and crated at night. It should not ever have the run of the house till after 6 months of age or housebreaking and training can become very difficult. A puppy should start formal obedience by 6 months of age, preferably sooner. Remember when you choose to adopt a dog you are choosing to take an animal into your home. The animal is not a human baby and humans are not born with canine instincts. Take some time to learn about the canine and be prepared to change your way of life to accommodate the new member of the family.